Jacob T. Barkman family, 1910. Preservings photo. Jacob T. Barkman: entrepreneur and pioneer; born 14 November 1848 in Rückenau, Molotschna Mennonite settlement, Russia, to Peter K. and Anna (Toews) Barkman. He was the eldest of five children. Jacob was baptized in May 1868. On 21 September 1869 he married Aganetha Giesbrecht (1849-1918). 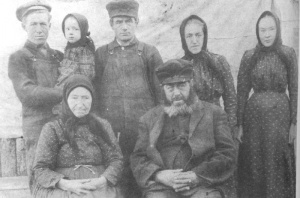 They lived in Rosenfeld, Borozenko Colony until their immigration to Canada in 1874. In Canada Jacob T. Barkman and his family settled first in Grünfeld, Manitoba and later moved to Steinbach. He opened the first store in Steinbach, where he initially sold oil, cheese, and many other goods. Later he began to sell farm machinery and tools, as well as fence wire. He was also a partner in a flour mill together with his father and did custom feed milling. In 1890 he moved to Heuboden where he continued to sell oil products, do custom milling jobs, and transport produce and livestock to Winnipeg for sale. His main occupation became raising cattle. Jacob T. and Aganetha Barkman had 10 children, four of whom died young. They also looked after five grandchildren following the deaths of their mothers. Jacob’s wife Aganetha died in 1918. On 6 March 1921, he married Maria L. Fast (1851-1936) in Kleefeld, Manitoba. Jacob T. Barkman died 11 June 1935 in Kleefeld. GRANDMA (The Genealogical Registry and Database of Mennonite Ancestry) Database, 5.03 ed. Fresno, CA: California Mennonite Historical Society, 2007: #5760. Loewen, Roydon K. "Jacob T. Barkman (1848-1935), Heuboden." Preservings No. 13 (December 1998): 68-70. Huebert, Susan. "Barkman, Jacob T. (1848-1935)." Global Anabaptist Mennonite Encyclopedia Online. November 2007. Web. 21 Apr 2019. http://gameo.org/index.php?title=Barkman,_Jacob_T._(1848-1935)&oldid=94070. Huebert, Susan. (November 2007). Barkman, Jacob T. (1848-1935). Global Anabaptist Mennonite Encyclopedia Online. Retrieved 21 April 2019, from http://gameo.org/index.php?title=Barkman,_Jacob_T._(1848-1935)&oldid=94070. This page was last modified on 23 August 2013, at 14:26.